Being pregnant, the first couple things I purchased was Swaddle Blankets. I don’t know why, maybe because I don’t know the gender yet, and this is one thing I can buy that can be used for both male and female. I didn’t realize how important Swaddle blankets are for a newborn. That being said, I’m so happy I learned about SwaddleDesigns. “Lynette Damir, RN, CEO and Creative Director, founded SwaddleDesigns in 2002 with her husband, Jeff. The inspiration for SwaddleDesigns was sparked when Lynette visited families with new babies in their homes and she noticed they struggled with swaddling for two reasons. First, the blanket they were using was too small or too thick, and second, they could not remember how to make a good secure swaddle. The parents consistently asked her to share the secret of the hospital nurses – how to swaddle. The Goldilock’s Guide helps new parents remember the importance of keeping baby comfortably warm. You can learn more about this, at the SwaddleDesigns Safe Sleep Page. You can learn how to swaddle by watching SwaddleDesigns informative video, ( instructions are also on the blanket) here. You can also join SwaddleDesigns Exclusive Club where you will get coupons and special offers. 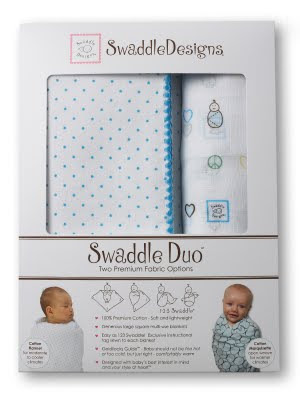 I love SwaddleDesigns Swaddle Duo and I suggest every new mom has these! Buy: Swaddle Blankets are available in 17 styles and have a MSRP of $38. 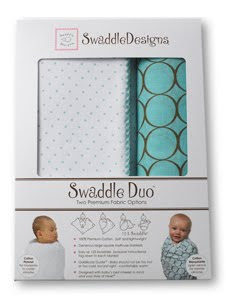 Buy your SwaddleDesigns Swaddle Duo here. The Giveaway: One winner will win their choice of blue or pink SwaddleDesigns Swaddle Duo ($38 value!) To enter, fill out the Google Spreadsheet below, please leave each bonus entry separate. -Become a Facebook Fan of Swaddle Designs on Facebook and tell them your favorite product. Giveaway will end 6/28. Open to the US and Canada. Winner will be chosen by random.org and will have 48 hours to respond to the winning email.